All American Landscape & Masonry can provide you with outstanding landscape design services without hurting your budget. Having started operations and grown the business in Rhode Island, our company enjoys the great advantage of possessing intimate knowledge of what works best in landscapes across the state. For example, our landscape designers are fully aware of the state’s native trees and ornamental plants, so they will incorporate such elements in their design proposal. These and other advantages easily make us the company of choice for property owners in select Rhode Island cities, including Portsmouth, Middletown, and Newport. So if you want to truly have an exceptional landscape design that will serve as a springboard for your dream property, please don’t think twice about hiring us. Achieving a landscape that stands out in terms of aesthetic merits and practical benefits doesn’t happen by accident. Instead, it takes a highly skilled and creative individual to effectively use basic design principles, such as balance and harmony, to come up with a landscape design that captures the client’s dream outdoors. A well-designed landscape can effortlessly add visual appeal to any plain outdoors through the creative use of design elements. Additionally, professionally rendered design plans help create a well-balanced landscape where no single element overpowers the other. And at All American Landscape & Masonry, we can address your need for a masterfully designed landscape. With the help of our experienced creative designers, you can have a landscape that combines form and function. We are confident that you will be satisfied with our works since we have already created numerous designs for our clients in Portsmouth, RI and surrounding areas. Our company uses modern landscaping design software to achieve outstanding landscape designs for our clients. With this tool, we can make multiple revisions without much delay, hence ensuring timely project completion. 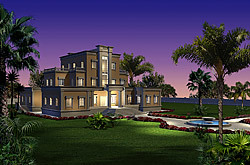 We also help clients visualize their dream landscapes by providing them with detailed and full-color designs. 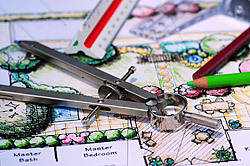 Most landscape design plans share common features or elements. Among others, we include softscapes (trees, annuals and perennials, shrubs, and vines), hardscapes or outdoor living amenities (outdoor kitchens, sitting areas, gazebos, patios, walkways), and fire and water features (ponds, pools, fire pits, and fireplaces). We collaborate with you to ensure that all your needed features and amenities are included in our design plans. Before we proceed to the design stage, we also consider other important factors, such as your budget allocation, design preferences, and technical specifications. Moreover, we consider the available space, as well as the existing structures and features in the property, so we can properly position all the elements in our design proposal. All American Landscape & Masonry is the company that most property owners in Portsmouth and other Rhode Island cities go to for their landscape design needs. Be it a small outdoor area or an expansive private residence, we have the skilled manpower, logistics strength, and access to first-rate design tools to successfully take on any design job. Call us today at 401-619-5296.